He’s done furniture, lighting, sculpture, even watches for Fortis. Now can add five-star hotel restaurant to his list of commissions. 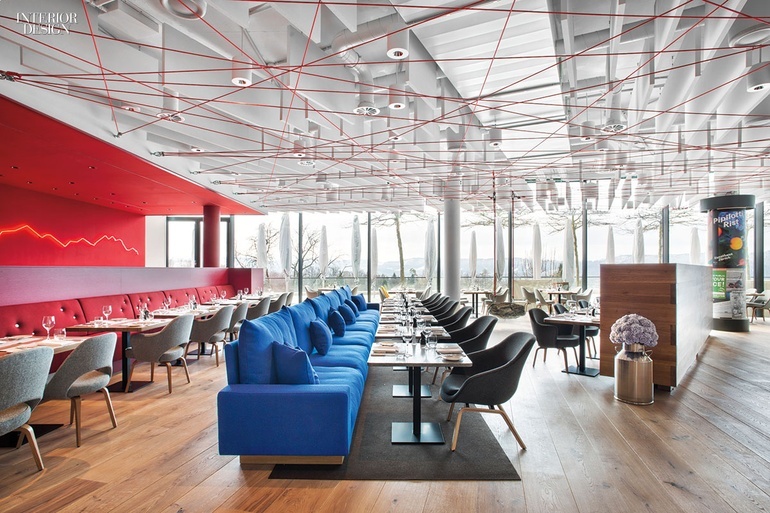 Working with local firm , he designed Saltz as an homage to the Swiss Alps—fitting as the eatery is inside Zurich’s , itself recently renovated by Foster + Partners. Beneath wide oak floor planks, the ceiling is crisscrossed with red mountaineer rope, anchored by a 550-pound granite boulder and pulley system, while a wall hosts a neon fixture resembling the outline of the 182 mountain peaks visible from the restaurant’s terrace.